Increase Organic Traffic For Maximum Returns! Okay, so here’s the situation. You have hit a plateau with your organic traffic, you have none or a small amount, and just aren’t seeing the increase in clicks to your site that you are sure is out there. What should you do? Happy news: it is possible to increase organic traffic, as long as you keep up with the changes that Google is constantly making. Because that’s the truth of it, Google is evolving almost continuously. The algorithms are changing, as is the type of data Google shows within its search results. You can check where your site stands organically now with the new algorithm changes using this free SEO audit tool. 1. Is your website mobile-compatible? If you run a consumer website, you already know to make sure your website is mobile-compatible. On the other hand, a B2B entrepreneur might think that since very few people use a mobile device when checking out a B2B site, it’s not important to make the pages mobile compatible. Google, on the other hand, disagrees with that thought because of the dramatic increase in mobile searches. By the end of 2015, we expect to see about half of Google’s paid search clicks come from mobile devices. This is one reason why Google is taking load time into account when the search engine ranks your site. If you want top rankings in search engine results pages, you should make sure your site is responsive and fast-loading. You might not see much improvement in your search traffic in the short term, but you most likely will see improvement in the long run. Your probably wondering, how much does a responsive website cost? Here is an instant website quote calculator. The future of link building lies in implied links. What are those, you’re probably asking yourself. The answer is this: an implied link is a “brand mention,” a place where your particular company name is mentioned but not linked. Google is working on adding support for implied links to be used to impact rankings, so you should focus on more than just links. Get your name out there, even if you can’t get a link to your site. One way to get more brand mentions is to get interviewed. When someone interviews you on their website or blog, they will at least mention you and/or your company name. Sometimes, they’ll even provide a link. Work on getting more people to interview you, and you can generate more backlinks or implied links to your pages. If you can get authority sites to link to your internal pages, it will make your search traffic skyrocket. For example, you can put together an amazing infographic, blog post, report, ebook, etc. and then build relationships with authority site owners such as Forbes, Huffington Post, and Entrepreneur. It won’t always work and you will have to start small, but you have to start somewhere. Once you get in the door, you can provide “QUALITY” content that links back to your site. Example: I wrote this article. It had over 750 shares and it generated 63 leads for my business. You can see the links back to different pages on my website. Having someone pitch these story ideas for you is an investment, but one that will provide you 63 leads in 1 day. You can also always do it yourself. It constitutes a lot of work, but it helps increase web traffic rapidly. Make sure to do a ton of research on who to pitch to first as some are frauds. One major evolution in Google is that the search engine giant is trying to focus on answering people’s questions. If you do a search in the form of a question, you will often get an answer that looks like, well, an answer. Since Google’s Hummingbird update, the search engine is better able to understand the meaning of words and phrases, which enables the results page to display helpful answers to your question together at the top of your search results. Want to get your own content at the top of the search results that way? Of course you do! 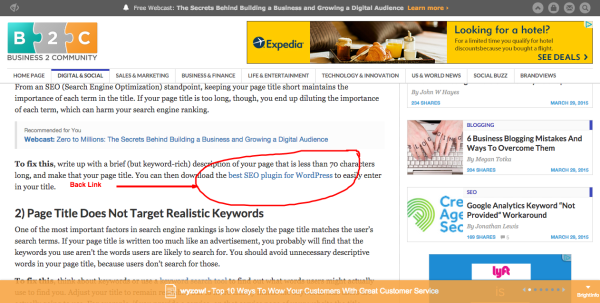 That is why you need to answer specific questions in your content, so your blog can be listed right at the top. For example, this article uses “How can I increase organic traffic in 2015” as the title; this is a very specific question. We then go on to answer that question, which helps Google realize what the blog post is doing and better rank and categorize it. Maybe you’ve noticed this, and maybe you haven’t, but Google is getting smarter about where you are located. 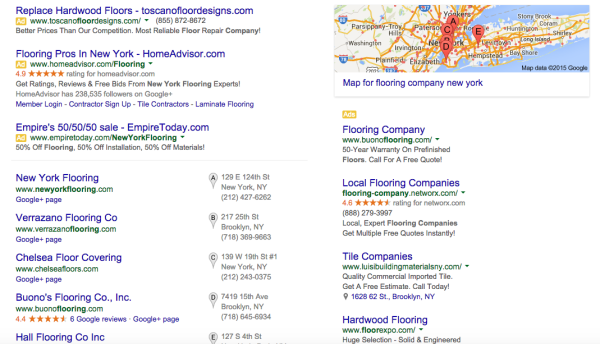 If you do a search for a term like “flooring company,” you will generate different results than I do, because Google has begun showcasing local companies within the search engine results pages. If you want to increase web traffic, you should set up pages that target each city you want to rank well in. Yelp does a great job of this, and the results they’ve seen have been pretty amazing. You do want to be careful, though, that you create unique, high quality content for each city page. Otherwise, your pages will end up being penalized instead of showcased. The old black hat way was to put each city name in the footer. DO NOT DO THIS. Google sees right through this. These tips will work to increase blog traffic too, and will help you crest the plateau of your search engine traffic increases and then keep going uphill. Just keep at it, and keep paying attention to the ways in which Google is evolving, and you might never hit a plateau again. Did you find these tips useful? Are you using another way to increase your organic traffic? This article was syndicated from Business 2 Community: How Can I Increase Organic Traffic In 2015?